Karin Boyce Valdizan earned her BA in Music and German from Luther College in Decorah, IA and an MM in Violin Performance from the University of TX at Austin, where she studied with Dr. Eugene Gratovich. Karin was also coached by Professors Roger Meyers and Paul Olefsky. While at UT Karin honed her teaching skills with the prestigious University of TX String Project, led by Anne C. Witt and still overseen at the time by Phyllis Young, the program’s creator. As a graduate student and emerging professional, she taught and performed throughout Texas, as a youth string instructor at Texas Christian University and at Austin School of Music, among others. She was a regular member of the Waco and Mid-Texas Symphonies, and also appeared with Dallas Wind Symphony, Corpus Christie Symphony and Laredo Philharmonic to name a few. Upon returning to Minneapolis, Minnesota, Ms. Valdizan gained a position on the faculty of MacPhail Center for Music, the largest of the 7 guild community music centers in the U.S., where she has taught for the past 20 years. She maintains a sizable private studio of violin and viola students, which also includes online distance lessons for individuals and group coaching sessions. In addition to her studio, Karin teaches small group classes with the School Partnerships program, as well as serving as an adjudicator for competitions, juries and talent show events. 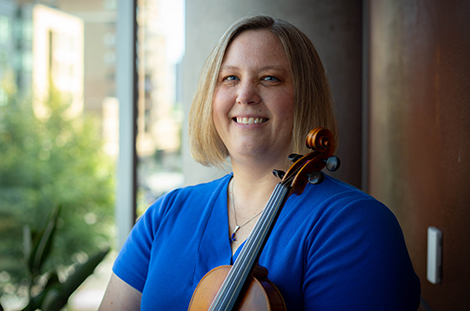 Ms. Valdizan is an experienced orchestral and chamber music specialist, serving as the Associate Principal of the Wayzata Symphony Orchestra, led by Marlene Pauley, and free-lancing throughout the Twin Cities Metro Area on both violin and viola. She also performs annually with the Borderline Philharmonic Chamber Orchestra.